One of my highlights of the 2010 Victoria Fringe Festival was seeing Saltwater Inc’s production of Kurt Weill’s Mahagonny Songspiel. Joanna Hounsell had only recently formed Saltwater, and this was an ambitious project, complete with projections and choreography. 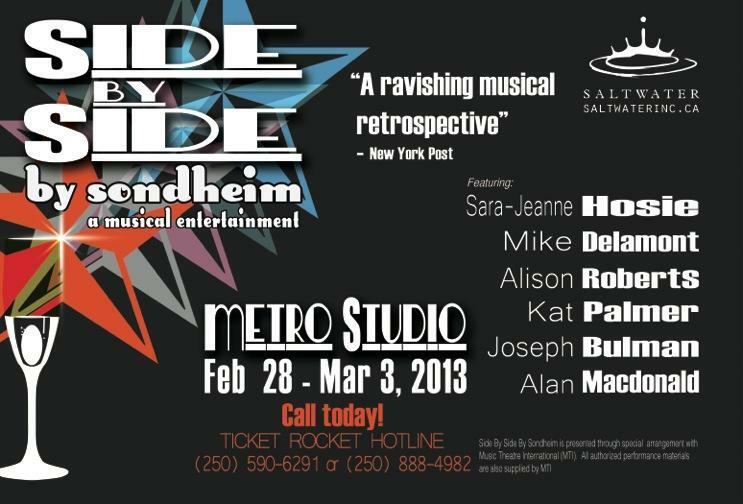 Now, she brings the music of one of musical theatre’s most-awarded composers and lyricists, Stephen Sondheim, to the stage with Side by Side by Sondheim. This revue features songs from well-known classics like Something Funny Happened on the Way to the Forum, Follies, Gypsy, Company, and West Side Story. A Musical Entertainment presented by Saltwater Inc.